I am going to start with Oakland Beach. 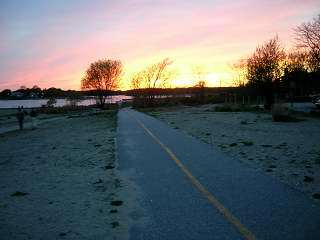 First, Oakland Beach has one of the lowest elevations in Rhode Island. Because of this, it was almost wiped out completely during the hurricane of "38. Oakland Beach used to be a great amusement park up until then. 40-50 years ago, Oakland Beach was the place to go for a summer vacation. People from Providence and surrounding areas would rent homes there and enjoy the beaches and views, along with the boardwalklike main road consisting of restaurants, complete with a Merry-go-Round. I remember staying there with my aunt and uncle when I was young and those memories are pleasurable. After awhile, Oakland Beach started to degenerate. A lot of the homes there are and were quite small. Most of them had been beach houses, now converted to year round homes. Some were badly neglected and the neighborhood values deteriorated, attracting a more transient type of person who was not interested in keeping up their home. Now, after the increase in Real Estate values in Rhode Island, especially in waterfront communities, Oakland Beach has started to awaken from its slumber. Take a drive through and see the new construction, homes being redone, smaller homes being torn down. Yes, there are still some of the neglected homes, but the trend is definitely on the upswing. I predict Oakland Beach to be a good investment for anyone who is considering beach property and cannot afford some of the higher priced areas in Rhode Island.